Tree with abundant white sap. Stipules not surrounding the twigs, not leaving circular scar when dropped. Leaves alternate, distichous (in one plane along the twig), simple, glabrous, lower surface usually whitish. Fruit placed on branches, c. 6 cm diameter, smooth to warty, velvetly hairy, green-yellow, with seeds placed in pink flesh. Small to large-sized tree, rarely up to 54 m tall, 63 cm diameter; buttresses up to 3.3 m high. Bark grey-brown or orange-brown, smooth to cracking. Twigs 5-7 mm thick, covered with short rough hairs. Stipules non-amplexicaul, ovate, c. 0.4 cm long, hairy outside. Leaves simple, distichous, upper surface glabrous except the midrib, lower surface rough-hairy, often glaucous; oblong or obovate, 12-33 ¡Á 7.5-19 cm, base cuneate or rounded, margin entire, plane, apex acuminate, acumen up to 1 cm long; midrib flat above; lateral veins 10-16 pairs, prominently raised below, sunken above; intercostal venation scalariform, raised below, faint above; petiole 2-5.5 cm long, short-hairy, often glaucous. Inflorescences solitary, axillary; bracts numerous with peltate upper parts. Male heads globose, c. 1.8 cm diameter, sessile or with c. 0.5 cm long hairy peduncle; perianth 3-lobed, covered with short hairs; stamen one, exserted with stout filament. Female flowers with exserted, 3-lobed styles. 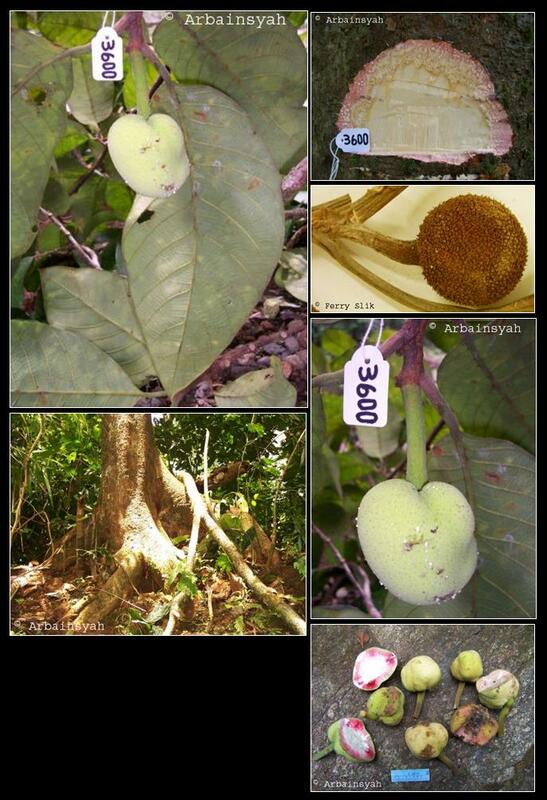 Syncarps sessile or short-peduncled, subglobose, c. 6 cm across, surface warty, velvety hairy, pale yellow with pink flesh when ripe. In undisturbed to disturbed mixed dipterocarp forests up to 700 m altitude. On alluvial sites near rivers and streams, and on hillsides. On clay soils. Borneo: Buruni, Dadah, Salangting, Tampang.